Okay, I admit, Jor-El not as an evil guy but an old man suffering an existential crisis as he futilely fights back against his own obsolescence is the first time I've found him interesting since they resurrected him. Also, "He's the greatest!... But he's THE GREATEST" is goddamn poetry. Not sure I know the word "lortgin," though. I assume it's a word Jon picked up during his travels. I'm... not entirely sure that's what Bendis is going for? Like, the narrative doesn't frame him sympathetic in the slightest. Though maybe that's clearer in the full issue and not just the scans I posted. I've read the full issue and I disagree. Well, to me, Jon's reaction to Jor-El bearing his heart out and pointing out their connection as oddities as well as family being "Wow, this guy is crazy, I need to run away as soon as possible" is portrayed as being 100 percent right. 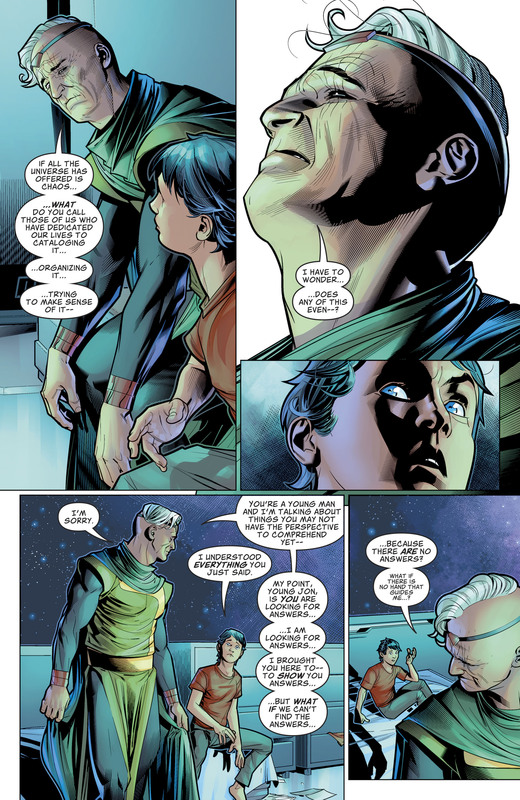 Additionally we have Lois and Clarks reaction more or less treating it like Jor-El intended for all this to happen, with Clark even contemptuously dismissing this existential crisis, the Green Lanterns shuffling off awkwardly when he shows up, and "the summer Grandpa wouldn't talk to me". 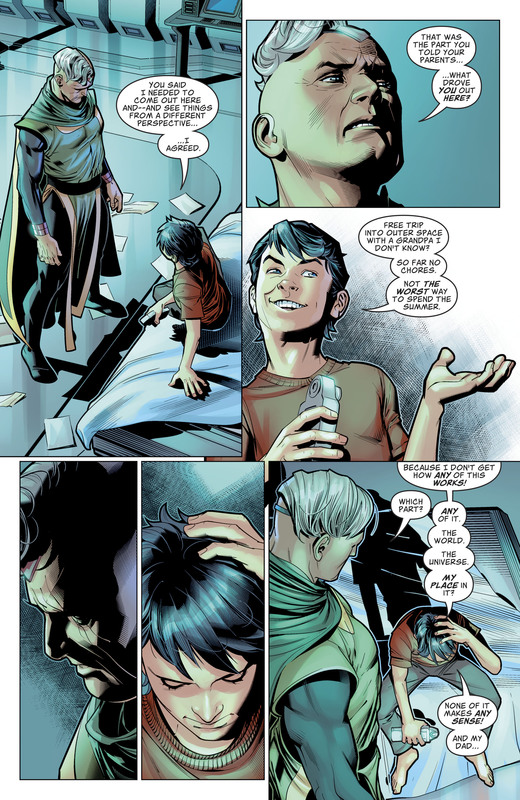 What makes it weird is that, taken on it's own, Jor-El IS sympathetic - he's going through emotional turmoil, he tries to bond with his grandson, he helps people throughout the galaxy and has an unerring ability to tell who's the good guy in a conflict, and even offers to take Jon home. 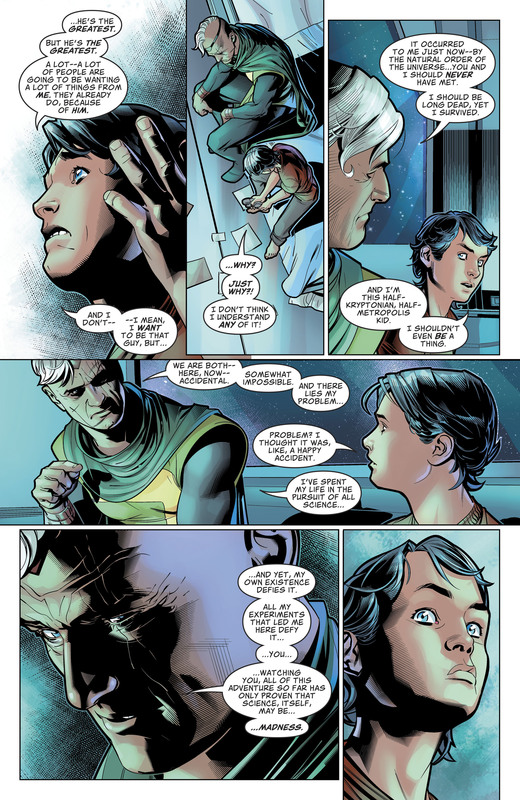 Maybe the future issues will portray this a bit better, but for now, there's a weird disconnect with what the narrative is telling us about Jor-El and what he's actually like. seriously? Jor-El being there is impossible? Clark knows several people with scientifically explainable tools that could go and grab him. They don't because it's assumed everyone died with Krypton and that has to die for Superman to exist. I think the point is that, From his point of view, his understanding of science and how the universe works... it should be impossible. Time travel should be impossible and something like Dr Manhattan should be impossible. Now, in-universe... they are not impossible, and we have clear, empirical evidence of that. But for a scientist who believed it to not be possible, it means re-evaluating A LOT of things that are false by the mere fact, say, Time Travel is a thing. For Jor-El, it is basically an identity crisis, because he suddenly feels like he doesn't know squat. think of it as harry potter. Harry and Hermione go back in time to save Sirius and buckbeak only to find out, they had already gone back in time to save Sirius and buckbeak. numerous stories use the predestination paradox, which is what you're describing. It makes sense. though I was reffering that to Jor-El, a scientist who has spent all his life "catagolizing, ordering and trying to make sense of the universe", the revelation of something "impossible" (which is "the laws of the universe I follow say it should not have happened, yet it did") means his understanding of the universe was wrong to a degree. 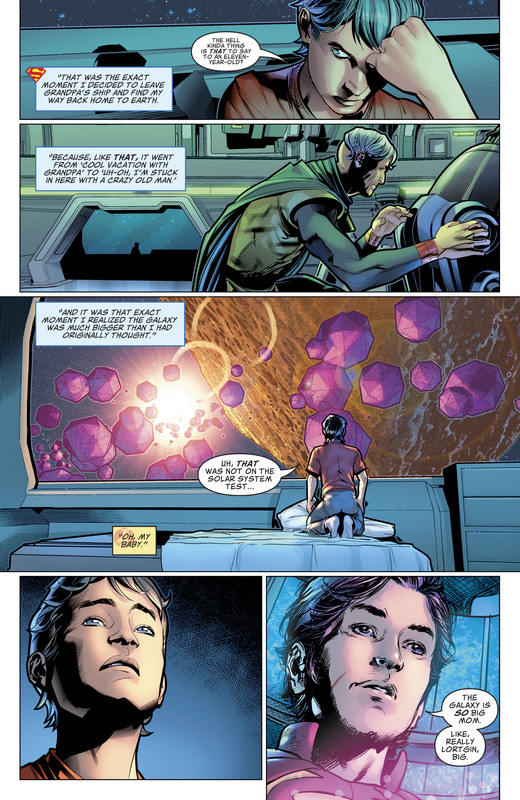 Some scientists would take it as an eciting new discovery, but to jor-El, it causes an identity crisis because he feels that made all of his work meaningless. "It's longer than you think, Dad!" Ha! Nice Stephen King reference. Calling it now: that's a Jon from the future, and lil' Jon is still out there with Grandpa. That would be fine with me... and it reminds me of a recent movie so that I'm really fine with that. That does make sense. Bendis likes to put his story elements back where he found them, so bringing in Future Trunks Jon means we get the older version without losing the happy pint-sized version. I really, really, really, really hope so. Besides the SuperSons miniseries, how many other books is Jon featured in? Any mentions of him by Damian in Teen Titans? He got the spotlight during a crossover with Damian's Titans, and featured heavily in the Superman books.